I'm looking at a 50 hp Tohatsu (new 2016). Anyone have experience with these engines in that power range? I didn't know they made them anymore. It was a few years ago, but a buddy of mine used to run one on his flats boat. He never had any issues and said it was always a great motor for him. Tohatsu is building engines for a lot of makers. They built all the Nissan's, a bunch of Mercs, some OMC's. I heard they even built some Honda's ... They are one of the best engines out there. They have zinc plated internal water cooling passages and other durability features. Is this a TLDI motor? Tohatsu are my number one choice unless the hull calls for a period correct motor. Yes, this is a TLDI motor. From what I have seen on the Tohatsu website, TLDI is the designation for two stroke engines. I don't know what the acronym means. I assume the DI stands for direct injection, but I don't know about the TL. TLDI® (Two stroke Low pressure Direct Injection) is a powerful direct fuel injection system that reduces emissions over conventional carbureted 2-stroke motors while also greatly increasing fuel and oil economy. With a TLDI® outboard, you get all the efficiencies of a 4-stroke outboard and all of the power of a 2-stroke outboard in one. What is the reason for a Direct Injection 2-stroke? In 1998, the U.S. Environmental Protection Agency (EPA) issued new regulations governing the emissions of outboards sold in the United States. The purpose of these regulations is to reduce the pollutants created by outboard motors. 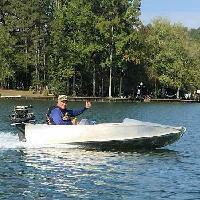 In short, the EPA regulations mandate that all outboards meet certain emission requirements by the year 2006. Outboard manufacturer’s are using a variety of technologies to reduce the emissions of their outboards including 4-stroke and direct injection 2-stroke technologies. Do TLDI® motors meet the EPA emission requirements? YES! All current TLDI® motors meet or exceed the current EPA requirements for outboard emissions and are CARB 3-STAR approved. What are the advantages of TLDI® over a carbureted 2-stroke outboard? The TLDI®’s ECU electronically monitors the performance of the motor and delivers the precise amount of oil needed depending on the rpm, drastically reducing the oil consumption by up to 30% over carbureted 2-strokes as well as the amount of exhaust smoke associated with traditional 2-strokes. What are the advantages of TLDI®? The biggest challenge facing outboard manufacturers in meeting the current EPA regulations is which technology to use…direct injection (DI) 2-stroke or 4-stroke. Both technologies can be used to meet the current standards and both technologies have significant advantages over carbureted 2-strokes. Most manufacturers are taking a “two-pronged” approach and using a combination of DI and 4-stroke depending on the horsepower of the motor. What is Low-Pressure Direct Injection (such as TLDI®) and how is it different from High-Pressure Direct Injection? A high-pressure system forces straight fuel, up to 1000 psi, into the cylinder through the injector. A high-pressure system does not blend air with the fuel, so the droplets of fuel are much larger and do not burn as completely as fuel droplets in a low-pressure system. A less complete burn results in weakened fuel economy and the intense stress of 1000 pounds of pressure can also cause unneeded strain on the motor’s components. A low-pressure system, such as TLDI®, mixes both air and fuel to disperse microscopic fuel droplets at 80-94 psi. With droplets as small as 10 microns, we achieve a more thorough and complete burn of the fuel resulting in lower emissions and higher fuel economy without subjecting the components to the intense pressure used by other direct injection systems. What kind of oil do I need to use in my TLDI®? TLDI outboards should only be run using an oil that meets or exceeds TCW3 oil specifically formulated for use in Direct Injection motors and are semi-synthetic or full synthetic. Standard TCW3 oil is not recommended for use in TLDI outboards. Recommended oils listed below. What is the “User Adjustable Idle Setting” feature? A unique feature on our TLDI® outboards is our user adjustable idle speed system. By pressing in on the key switch, you are able to adjust the idle from 700 to 900 RPM’s while you are using your outboard. Our TLDI® system will even remember the last setting and use this speed the next time you use your motor. In areas where currents are stronger or constantly changing, this makes time spent trolling all the more easier and pleasant. And because the TLDI® is a direct injection outboard, trolling for extended periods of time drastically reduces the occurrence of fouled spark plugs. Is there any special maintenance required for a TLDI®? Unlike a 4-stroke motor, there is no special maintenance required for a TLDI®. We do, however, recommend that you change your water pump impeller every year. We also recommend that you change the compressor drive belt, air filter, and fuel filter every 2 years or 200 hours. Other than that, you follow basic outboard maintenance as outlined in your owner’s manual. Do I need a special battery to start a TLDI®? Because of the additional power requirements needed for a direct injection system, TLDI® motors require you to use a marine battery with the following rating: 850 Cold Cranking Amps (CCA). For users in colder climates, you should use a battery with a rating of: 1000 Cold Cranking Amps (CCA). Is TLDI® a reliable technology? We thoroughly test new outboards for years before they are introduced to consumers. The TLDI® system was tested for 6 years before being released and has been on the market since 2000. These outboards also use the same tried and true components we’ve been using in our conventional 2-strokes for years, giving boat owners exceptional reliability and the utmost confidence in their outboard. What models are currently available? We currently offer 40hp to 115hp in a TLDI® version (as well as as a 25hp & 35hp "JET" model). What is the warranty coverage on a TLDI®? We offer one of the best warranty coverages of any Direct Injection outboard available on the market. The 5 year limited warranty covers parts & labor. Our new 5 year warranty, covers all TLDI models sold for non-commercial use from January 1, 2013, for 2011 production models or higher. Why should I buy a TLDI®? The TLDI® system provides all of the things you need in an outboard. It provides superior performance while providing exceptional fuel and oil savings. A TLDI® outboard produces fewer emissions and meets all federal and state requirements for outboard emission control. Acceleration from low to high speed is extremely smooth and sharp making the outboard very responsive. Also, the reduction of air intakes from three to one allows much quieter operation. With a TLDI® outboard you get all the punch & power of a 2-stroke combined with the quietness and fuel efficiency of a 4-stroke, together into one fantastic motor. I'm just wondering, with all the direct injection systems out now, why no one is building supercharged, non-crankcase ported 2 strokes with a conventional 4 stroke oiling system, ala the old GMC diesels. Then we wouldn't be burning ANY oil... has anyone done this? The Tohatsu's are very skimpy on oil and it's injected at the bearing sites. The whole pollution thing is not just oil. The carb'd 2-strokes were outside their optimum port timing and other efficiency criteria at idle. So they had reversion and other pulse related issues that would cause them to pass un-burned fuel and oil out the exhaust. I'm with you about the drooling GMC's, we used to call 'em "Screamin' leakers!" I worked on a big generator once that had a 16v71 on it... what a sound that was!! Did a little research and found a study done a few years ago on a pressure fed, direct injected gasoline 2-stroke. It had intake ports at the base of the cylinder and 4-stroke style exhaust valves in the head. They used a supercharger for low speed and a turbo for high speed. Pretty complicated but a 0.6 liter engine of this design was equal to a modern VW 1.6 4-stroke in performance and fuel economy.